Luminesce™ skin rejuvenation treatments for helping to restore your skin's natural health and beauty at USparkle Therapy Centre in Christchurch, New Zealand. Offered in the privacy and comfort of the USparkle Therapy Centre & Day Spa, our beauty therapists offer refreshing Luminesce™ skin rejuvenation treatments. Age defying radiance and luminosity! The stem cell technology allows for the delivery of key growth factors already found naturally in the body by penetrating through the pores of the skin and working with body processes to stimulate production of matrix proteins, such as collagen and elastin. These growth factors are the language of the cells, and communicate certain specific instructions to carry out, such as lowering inflammation, building new blood vessels, and producing collagen. This cellular communication process is one of the miracles of Luminesce™ cellular rejuvenation serum. Dimishes the appearance of fine lines and wrinkles. 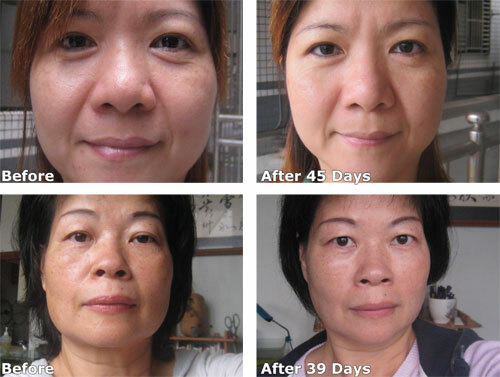 Here are some examples of the effects of Luminesce™ Skin Rejuvenation treatments on patients. In this last picture, she only applied Luminesce™ to one side of her face for 60 days. A picture was then taken by a dermatoscope, and you can see the dramatic difference between the side of her face where the new collagen is being formed, compared to the redness and blackheads still visible on the side where no product was used.